Is it really Monday again? This week has flown by and with that not a lot has gotten done on the mystery quilt. I have been sewing folks, really I have. I have one quilt top three quarters done. Another one is about a fifth done and the final one hasn't been started. I have twelve days get that those three done. I did work on the mystery quilt for about an hour. I know Bonnie calls it a winter mystery but the weather here certainly doesn't feel like winter at all. There was a lot of pressing and picking of fabric, which blue with which neutral. Those that are following Bonnie's color picks are sewing gold and neutrals to make four patches. 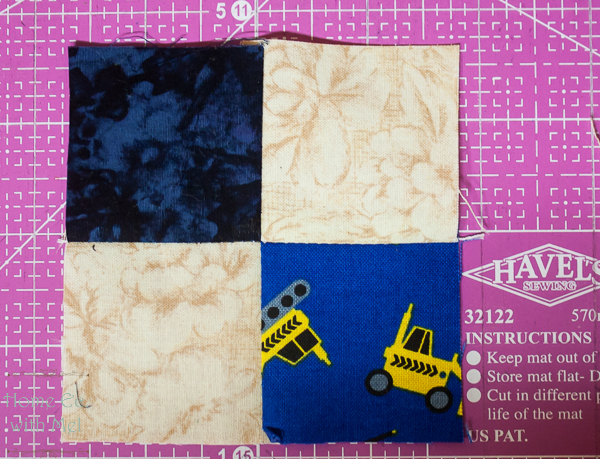 Even if you aren't doing the mystery quilt Bonnie has some great tips for making four patches on this clue. So are you ready to see what I got done? I got 10 of these done. Just like this one. Since I'm only doing half the units that means I'm a sixth of the way done with clue three. I know it doesn't sound much but when you haven't touched clues one and two this is huge. I started with clue three because not only is it what everyone else is showcasing this week, it's also not a triangle. I've been working on triangles for the two quilts that I've got going right now. I needed a break so an hour of sewing four patches was just perfect. Even if it was only just an hour. I know several of you who are reading this have done Bonnie's mystery quilts before. How do you store your clues? I was thinking sandwich bags with the clue number on them. I'm linking up to Bonnie's link up. You can check out how other's are progressing there too. Part 1, Part 2, Part 3. I use baggies (which I save and reuse from project to project) for the mystery quilt steps. I insert a slip of paper in the baggie with the step number and other info, such as "120 four-patches". I like your choice of blue here. I have used baggies in the past. This year, I am putting them in one of the trays of my Elfa organizer. I keep a different current project in each tray. Working well so far. Your blue is pretty. I put them in a big basket...very pretty blues. I store mine in a bin and some in ziplocks in the bin too. Love your fun blue fabric with the dozers! I use paper bags. I write on the front the clue number, and the details of the pieces (colour, size, etc) and how many there should be. Then as I make them, I write how many are done on the front of the bag as well. I don't do anything fancy with my clues. Just stack them together. However, this year I have a pretty box to use. Wonderful colors for the four patches, baggies work great for putting each clue in.